Wherein Marc W., Juan Sandoval get pwned by Gaia! The last Rainiers report occurred mere hours after a fender bender outside of my beloved Cheney Stadium. Taking what I thought was a clear hint from Nature, I decided I was done with driving a couple of minutes to the game, even if I was late. I'm a walking fan, and I thought Nature would support that decision. But no - Gaia shows no favor to those supplicants who reduce their carbon footprints by walking, just as she shows no mercy to those Rainiers who are differently abled. Tonight's game pitted the Rainiers and the Portland Beavers, and the pitching match-up was mildly intriguing. Juan Done got the call for Tacoma, a few weeks after getting lit up by the Beavers in PGE park. Former M's farmhand Ryan Ketchner took the mound for Portland. Ketchner was a fave among M's minorleague fans for his decent K rates, but the org let him go in the Jolbert Cabrera deal back in 2004. No? Not even mildly intriguing? Eh, yeah, that was a bit of a stretch. Did I mention that Ketchner is almost totally deaf? Is that at least mildly heart warming? Whew, that's blurry. Let's move on. Juan Done imploded in the top of the third, giving up 5 runs on a two-run single by Vince Sinisi (4-4 on the day, with 4 wussy singles). Immediately after a chat with pitching coach Dwight Bernard, Done gave up a line drive 3R HR right down the line in left to 2B Craig Stansberry. Done also felt like he was getting squeezed and had a bit of a chat with the umpire after the inning (he also threw a pitch to the backstop after a late time-out call in the next half-inning; I don't think Done and the umpire will be meeting up for a beer later). Juan settled down and ended up going 6IP of 5H 5R ball, but the M's just couldn't get anything going against Ketchner who was 0-8 coming into the game. Ryan's line was a very impressive 7IP 4H 2R 2BB 9Ks. Juan Sandoval, the man who was *shot in the face* in his native Dominican Republic, came on to replace Done in the 7th, but Gaia would not let his inspiring story unfold. Sandoval uses goggles to reduce glare in his non-functional left eye (and if you just started reading at this point, I may need to explain that Sandoval's left eye was SHOT. In a restaurant), but Gaia petulantly started raining just after the 7th began. By the second batter, Sandoval couldn't see out of his right eye (his other eye having been SHOT OUT OF HIS FACE) and placed the goggles on the brim of his hat. The umpire, mad after being shown up by Juan Done, decided to assert control and told Sandoval to remove the goggles from the hat (maybe because they were reflecting light or something. I don't know; if a guy whose eye was shot out was on the mound, dealing 90+ heat, I'd let him leave some f******* goggles on his hat. That's just me. 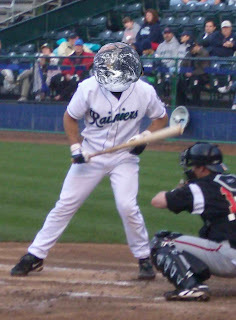 Gaia, this umpire, they loooove lording it over one-eyed pitchers. Dicks.). At this point Sandoval couldn't really see much, and he gave up 3 consecutive singles, scoring another Beaver run. In the 8th, the skies really opened up, and Sandoval clearly couldn't see much. After a lead-off walk, and a single following it, his night was through, and Jason Mackintosh closed things out by allowing one inherited run to score. In the bottom of the 8th, just as reliever Aaron Rakers was announced, a deluge began. Gaia knew I was walking home, and she saw my jeans and laughed, probably how her slutty cousin Fate laughed when she decided to have Juan Sandoval's left eye blown out. The game? The game was abandoned, and the Beavers "won" 7-2. I'm OK now, after a couple glasses of Basil Hayden's (my apologies for a somewhat scattered, eye-obsessed Report tonight), but I can't shake the feeling that Gaia was nasty, not just to me, but to poor Juan Sandoval. Gaia, for your actions tonight, you get the Morsels backwards K of the night. For M's 'spect watchers, Adam Jones started in RF tonight, obviously getting some work in the corners, should he be needed in Seattle (hint hint hint). Wlad took over in CF and looked OK, though he didn't have much to do. He nearly threw out a runner at home after Sinisi's bases-loaded single in the third, but his throw was just on the 1B side of home. 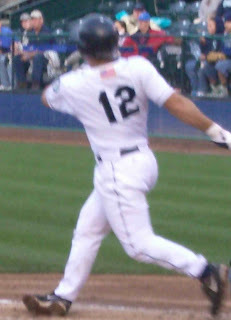 Jones also had a near miss, after nearly surprising Drew Macias at third following Luke Carlin's single. Jeff Clement followed his HR with a walk and a strikeout. Q: NBA draft/trade? Your thoughts? A: Awesome. The sonics get the best talent in the draft, coupled with an actual post presence in Green, who will probably outrebound the past 4 Sonics first-rounders combined next year. Losing RayRay is tough, but it's right for the team. Now sign Rashard, and call it a year. Oh, and stick around, too. Q: Wlad - is he for real, or is this some sort of fluke? A: As someone who's been talking about Wlad for years, including when 99% of M's fans thought he'd never amount to anything, I'm loving this. It's clearly for real too, despite an uptick in his K rate. He's simply a more disciplined, more advanced hitter. He's a guy who had huge flaws in his game, but who also had prodigious power and natural ability. By listening to his coaches and working on his flaws, he's made himself a legit blue-chipper, and I think that's awesome. M's bloggers need an underdog to root for with Snelling gone, and I think Wlad's the one (oh, uh, and ABD too! Sorry Paul!). Q: George Sherrill - how much of this is luck? A: Not much. Look, his peripherals looked almost identical to Mike Gonzales coming into the year, and he's gotten even better this year. He's dropped his walk rate, and his sneaky fastball is proving way too much for the best lefties in the game. Might he give up a longball to a righty? Might an inherited runner or two score? Sure, but we're witnessing one of the better lefty set-up seasons in memory; this one goes down with Arthur Rhodes' 2001, and it's clearly better (in WPA terms) than Ed Vande Berg's 1982. Enjoy it, and remember: Positive Paul told you this would happen. Q: M's pythagorean winning percentage is just 'meh' but they're right in the WC hunt. What gives? A: The bullpen gives, that's true. And given the number of freakishly terrible starts the M's have endured, it's probably not that surprising that the M's pythag is out of whack. They look like a contender 4 out of 5 nights, and that hasn't been true in a while. The biggest worry is the defense. Their team DER is terrible, and that's gotta change if they want guys like Batista and Weaver to keep them in contention. On the other hand, thanks to some nice bullpen management, the 'pen may singlehandedly keep this team in the race. Forget taking a lead into the 6th or 7th, with solid years from Sean Green and Eric O'Flaherty, this team basically only needs 4-5 innings (see Feierabend, Ryan) from its starters. There are still a ton of question marks, but there are also legitimate strengths, strengths that might keep the M's in the race this fall. This is all quite lovely for us NW baseball fans, but that pit in my stomach comes from the fact that Bill Bavasi may feel the need to make a move at the deadline this year. Last year, Bavasi gave up a 20-YO shortstop who's putting up a near .900 OPS this year to go along with MLB-quality defense for a RH DH who retired from baseball about 5 months after the trade. *Rad! * This year, I have nightmares that Wlad Balentien gets dealt for the grittiest, veteranest, clubhouse-mentorest crap the AL can belch up. That, or a crappy 5th starter. Eric Milton's on the DL, which eases my mind a bit, so here's hoping that Bill doesn't panic after Buehrle goes to the Yanks and trades Mark Hendrickson for Adam Jones or something. After his performance today, I'm starting to really remember why I liked the thought of adding Jeff Weaver into the rotation during the offseason. While I see him as having some issues with his emotions, tonight, and last week vs. the Pirates both, I saw a different player than what I saw at the beginning of the year. For some players, there's a fine edge between being able to control their emotions in a good way -- to channel that anger to dominate -- and to be demonized by them so that they collapse under the weight of their emotions. In the first part of Jeff's Mariners career, he was clearly frustrated and the cycle of frustration got so big that he looked helpless and lost any sense of how to pitch. Over the last couple of games, however, he seemed to keep things under wraps and channel that emotion into confidence. It's possible that the data shows otherwise, but it appeared that Jeff didn't let the jams get to him, and he was able to put a tourniquet on the bleeding when he needed to. That mental edge and the ability to get out of jams, whether major or minor, seemed to suggest that Jeff's turning things around. No, he won't be a great pitcher. It's likely that the balls that were getting pounded through holes to start the year aren't finding those holes right now. Jeff's just such an emotional guy, that when he's focused and controlling those emotions, he's more likely to pitch effectively. He's always been the type that needs confidence to pitch, and if you mess with it, he totally implodes. That's why he was kicked out of New York. Seattle's nurturing environment, both in the organization and in the fanbase, really is a good fit for Jeff. If he can get his ERA+ up from the low 40s to closer to 100, that's the same as adding another pitcher in there. I wouldn't bet on his recent performance being sustainable, but you can always hope. With no other options in our farm system (although Popeye Campillo would be fun to watch, perhaps) to slip into the rotation, it's very important that Weaver pick up the slack and clean up the mess he started with. Adding MORE pitching would be nice, but it's going to be expensive. And everybody's going to be trying to do it as well. I'll await Jeff's and Dave's commentary, if either of them take the time to say anything about his performance today. But I do believe he was being successful throwing whatever offspeed pitch seemed to work for him -- the change, the slider, whatever it was he had success with -- kept Boston off balance and limited the damage. A few balls were smoked -- the one off the LF scoreboard, for example, but it wasn't nearly like in the games earlier in the season. I hope it's more repeatable, now that he's shown success against both a horrible club and arguably the best in the league. I honestly sorta cheer for Jeff, in the way you sorta cheer for Spicoli in "Fast Times at Ridgemont High." Nice to see Hargrove stand in his corner today, like Mr. Hand did w/Spicoli. Could Griffey and Ichiro Co-Exist? I'm not tired of all the Griffey talk. I'm sorry if you are, and don't want any more. Too bad. While Buhner was my favorite M back in that era, Griffey wasn't far behind. Watching the two of them together, though, really drew me into baseball. Seeing Griffey play with his dad, too, drew me in further. To me, one of baseball's all-time greatest moments happened when Jr. and Sr. had back-to-back HRs. Such a feat hadn't happened before, and I'd be hard pressed to believe it'll happen again. 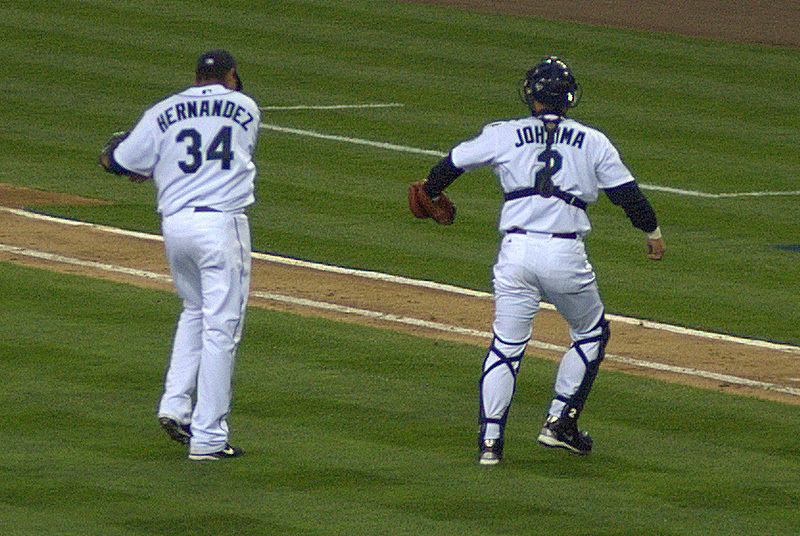 While I know that Junior is gone (as are those days w/the M's), the one that's still with us is still pretty doggone good. Again, the M's playoffs discussion starts with improving the run prevention -- via starting pitching and defense. Maybe Yuni will remember how to throw the ball to first base, and that will help some. And maybe they'll do something about that outfield defense. But a part of me can see a bit of merit in luring Griffey back to Seattle. Hear me out, before you blow a gasket. I recognize that it's folly to believe that a) he'd want to come back here and b) the M's would pony up the cash/players to make it happen. Let me be a fan boy homer for a weekend. And wallow in the misery of the joy of my past (and lack thereof in the present). Ichiro dreamed of playing specifically in Seattle, thanks at least in part to Junior? Again, that Junior may not be around anymore, but the Junior that is certainly has his value. He may have lost a dozen steps defensively, but he still loves playing the game. And he can still hit. He's still showing his 41% better-than-league-average bat. A career OPS+ of 141, and his 2007 OPS+ thus far still exactly right there. Looking to the future, too -- if Ichiro leaves, and the M's don't show any signs of moving towards giving the fans exciting October baseball, then they'll need something to really keep people interested. I'm all for a temporary stop-gap for excitement and relevance of the execs bringing back Griffey to spend his last days back here where he belongs. Landing career milestons in the uni from which he launched 'em. Felix will be good and all, but I doubt he's done anywhere close to 'nuff for the Safeco bandwagoners to crown him king of their hearts, like the blogosphere has (even if those crown-givers are seeing the tarnish in his crown). 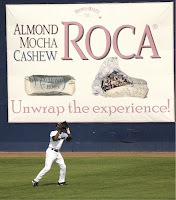 If Ichiro leaves, then the M's will be really hurtin' and will need a quick-fix to grab some fans back. It'd be completely easy for them to market the heck out of Griffey's return enough to keep 2 million or so ticket buyers' wallets open. It wouldn't necessarily be a bad move. Or, wait. It probably would. I'm just a victim of all this damned propganda! /Wakes up from dream land. Good on you, Jeff! Way to pitch a heckuva game. I don't care that it was against the Pirates -- you struggled against an equally-woeful Royals lineup, and showed that when you pitch with your brain you can pitch in the majors. Anyone who saw that one coming obviously has Marty McFly's 2007 Sports Almanac. Losing 3-4 to the Cubs, being swept by the Stros, and now a loss to the Pirates? NOW can Hargove be fired??? I don't care how poor of a reason this may be. It may just be a bit unfair to put it on him. Still, there's a window of opportunity there. Get rid of him now that we have the shot. His bias against having kids in there that can more likely help than not is killing the team. Yes, we need pitching. We need help in the rotation, especially, and perhaps one more good arm in the 'pen. We need a pitcher that can pitch deeper into ball games. Ultimately, though, is going out and surrendering prospects the only way to upgrade our pitching? The difference between good pitching and bad pitching, ultimately, is run prevention. 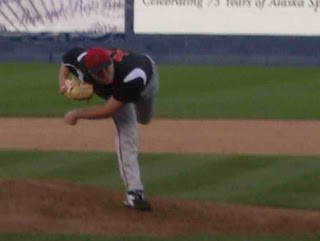 Good pitchers, in combination with good defenses, can increase run prevention. Mediocre pitchers can be helped out by having extraordinary defenses behind them. Upgrading the defense can at least slightly increase the overall run prevention side of the win/loss equation (that being that you have to score more runs than you surrender to win ball games). While defensive metrics are still not scientifically relevent yet, they're not completely useless either. Upgrading a notably bad, both statistically and scouting-wise, outfielder with one that is better can help the run prevention, and help the pitching. As long as the difference between the bat that's added and the bat that's replaced is minimal, and the impact on the more-scientifically sound run scoring side of the equation is neutral, at worst, the improvement on defense can make the overall team better. Having a good defense that's less likely to have miscues that extend innings and prevent pitchers from going deeper into games can improve a team's chances of winning. With the extra bonus, too, of possibly allowing pitchers to pitch deeper into ball games. While I recognize that this idea may be thinking outside of the box a bit for the Mariners, I'd bet that they're at least aware of the principles outlined here. Now, I'm not expecting a change, but I would like to imagine that moving a clearly-ready-for-the-majors Adam Jones into left field, defensively-challenged Raul Ibanez to the DH, and Jose Vidro to the first-bat-off-the-bench would actually help the pitching staff, and may slightly improve the offense. I realize there are several potential problems with this. It takes out one 'lefty' bat in Vidro, where this team doesn't need to surrender lefty bats. Raul Ibanez also is more comfortable when he's playing the field, and the potential discomfort he may have could affect his hitting. Jones also isn't a natural outfielder, even if he's a heck of an athlete, and while he has learned CF remarkably well, there's always a risk of seeing how well he'd transfer to LF. I don't see those things as major risks, though. They're very small, really, and I'd actually have Vidro in at DH vs. lefty pitching, and I think he could still get regular playing time. Plus, the type of hitter Vidro is (singles hitter, keeps the ball on the ground, rarely gets XBHs or flyouts) can kill a lot of rallies when he GIDPs. Jones has much more power, and while his batting average may not reach .290 in the bigs right away, there's much, much more to offensive numbers than batting average. I'd be willing to bet that Jones could put up an OPS higher than Vidro's .710, especially when given consistent playing time. And, I'd be willing to be that the pitching numbers would noticably improve, too. While Davis, O'Flaherty and Putz all did their jobs, the pitching hero definitely was our guy George. Coming in to relieve Morrow, with the bases loaded and only 1 out -- any sort of decent contact and the Cubs score a run. Top of the 9th with a lead, the Cubs probably would've won. Davis, EOF, and Putz wouldn't've gotten the chance to do what they did. And Willie wouldn't've gotten his gritty RBI (no thanks to Vidro who, when he finally made up his mind what he was doing, lucked into the run when Barrett dropped the ball). I don't want to take away from what O'Flaherty did tonight. He pitched incredibly well, and deserves a ton of kudos, too. But if GS52 doesn't do his job in the 8th, the M's don't make it to extras. Big High-5, George! And a big high-5 to the team for making it a team effort and a team win tonight. Refuse to Lose is BACK! So, I'm really starting to get tired of Felix being crowned king already. Yeah, he's got great stuff. He's got excellent pitches -- the best I've ever seen, too. Problem is -- he seems to have issues knowing what to throw when. It seems like the hitters are ignoring his good stuff, and just sitting on his fastball, knowing that he's going to give it to them -- up in the zone, just where they want to see it. Although I didn't watch the game yesterday, I saw the highlights. And, I heard enough of Bill Krueger to know that Bill was way off base. No, Felix doesn't need to lay off of his breaking stuff. He needs to establish his curve, his slider, and his 2-seamer. He needs to throw those for strikes. It sounds like the defense was sort of an issue yesterday, as Ellison was a little rusty in CF, and Lopez had issues turning the DP. Still, Felix wasn't getting people to swing and miss, which is vitally important to how he pitches. He was being hit hard -- and in the post-game interview (in English, admirably), he even admitted that he was struggling mightily with his command. I'm still wondering if it's pitch selection he's struggling with. And, he really needs to recall the first two games from his mental memory bank. That could make the difference between the M's staying in the hunt (either for the Wild Card or the Division) and falling back down into the cellar. Or, is he really healthy? His last few performances may suggest otherwise. He's definitely not the Felix I saw in the first two games of the season.